We are thrilled to be able to offer you this fantastic limited numbered Brutale 800 RR America. Italian design and flare at its very best. Motorcycle Art. Simply gorgeous. Low rate PCP or HP Finance is available on this bike, credit subject to acceptance. Mv Agusta's brilliant three cylinder 798 cc naked roadster. 36 months warranty and 12 months RFL. 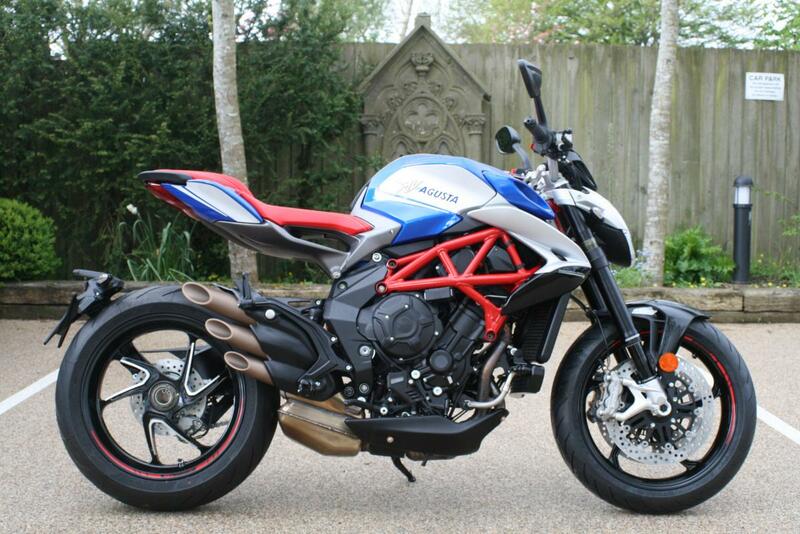 he MV Agusta specials have been a huge success. That success now continues with the new Brutale 800 RR America. In dealerships as of April 2018, this latest model offers an original, stylish take on a piece of MV Agusta history. The Brutale 800 RR America is equipped with a 3-cylinder in-line engine renowned for its performance, compactness and cutting-edge technology. The special version has been developed on the basis of the Brutale 800 RR, a model that has just undergone far-reaching renewal. Starting with a complete redesign of the gearbox - now with even smoother, more precise meshing - the bike is brimming with technical upgrades. A new balance shaft and redesigned primary transmission, optimised shaping of the intake and exhaust cams plus new valves are just some of the many improvements on this bike. Electronic engine control has also been upgraded with new algorithms and engine mappings. Traction Control has been refined even further by honing strategies and calibration. The chassis has also undergone a number of technical upgrades, including the new engine-to-frame attachment system that increases the torsional rigidity of the motorcycle. Another new feature is the rear cush drive system, designed to maximise riding comfort. This numbered Special Edition has plenty of distinctive features, starting with a metallic blue colour scheme that catches the light with shimmering iridescence. The tank sports a star-studded motif, just like the one on the 1973 750 S. Gloss black paintwork enhances many features, such as the front mudguard with MV Agusta logo and the radiator side panel which sports the wording “America Special Edition”. Thanks for looking! !